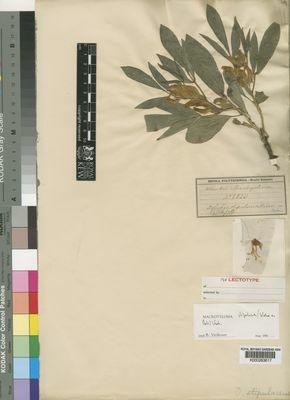 Macrotyloma stipulosum (Welw. ex Baker) Verdc. This species is accepted, and its native range is Kenya to S. Tropical Africa. Erect herb up to 30 cm tall, from a perennial woody tuberous rootstock. All axes white spreading pubescent. Leaves 3-foliolate, occasionally lower leaves 1-foliolate; leaflets 2.4–10 × 0.5–2.5 cm, oblanceolate, elliptic to narrowly elliptic, rarely linear, slightly discolorous, rounded or subacute at the apex, apiculate, cuneate at the base, sparsely hairy to glabrescent on both surfaces; petiole 6–25 mm long; rhachis 2–4 mm long; petiolules 2 mm long; stipules 7–15 × 3–5 mm, oblong-lanceolate, striate; stipels 4–5 mm long, narrowly lanceolate. Flowers axillary, in 3–4-flowered fascicles; peduncles 2–5 mm long; pedicels 4–10 mm long; bracts 3–5 mm long, linear; bracteoles 3–4 mm long, linear. Calyx tube 2–3 mm long, glabrescent or sparsely pilose, striate; lobes 4–9 mm long, sparsely pilose, the upper pair fused for up to three-quarters of their length. Standard 12–20 × 8–13 mm, broadly elliptic, emarginate at the apex, pale green to yellow flushed with pink; wings 17–21 × 3–4 mm; keel 13–17 × 3–5 mm. Ovary 9 mm long densely white sericeous. Pods 4.5–6 cm × 5.5–6.5 mm, linear, compressed, densely appressed pilose, beaked, 9–10-seeded. Seeds brown speckled black, 2–3 × 2–3 × 1–2 mm, squarish. Erect perennial herb 10–30 cm. tall, with a carrot-like woody rootstock. Stems covered with spreading white hairs. Leaflets 3 or on lowermost leaves 1, paler beneath, oblong-elliptic to linear or oblanceolate, 2–7·5 cm. long, (0·15–)0·9–2 cm. wide, rounded or subacute and mucronulate at the apex, cuneate, glabrous or with sparse hairs on the midrib and minutely granular above, sparsely pilose or glabrescent beneath; petiole 0·6–3 cm. long; rhachis 2–3·5 mm. long; petiolules 1–3 mm. long; stipules persistent, oblong-lanceolate, 6–13 mm. long, 3·5–4·5 mm. wide, veined. Flowers 3–4 in axillary fascicles; peduncles 2–6 mm. long; pedicels 4–12 mm. long; bracts and bracteoles persistent, linear, 3–8 mm. long. Calyx-tube 2–5 mm. long, veined, glabrescent or sparsely pilose; lobes linear-lanceolate, 5–9(–12) mm. long, sparsely spreading pilose, the upper pair joined for half to three-quarters of their length. Standard pale greenish or yellow with some pink flushing, broadly elliptic, curved, 1·4–2·1 cm. long, 1–1·4 cm. wide, shallowly emarginate. Pod linear, 4·5–6 cm. long, 5·5–6·5 mm. wide, compressed, margined, narrowed to the beaked apex, densely adpressed pilose. Seeds pinkish-brown with black speckling, squarish, longest dimension ± 3 mm., shorter dimension 2·5 mm., 1·5 mm. thick. Grassland subject to burning, Brachystegia woodland; 1200–1650 m.
Macrotyloma katangense (De Wild.) Verdc.